(creapure, creatine aab, dicreatinemalate, creatine nitrate, con-cret creatine hcl (100% concentrated creatine), cinnulin pf.). 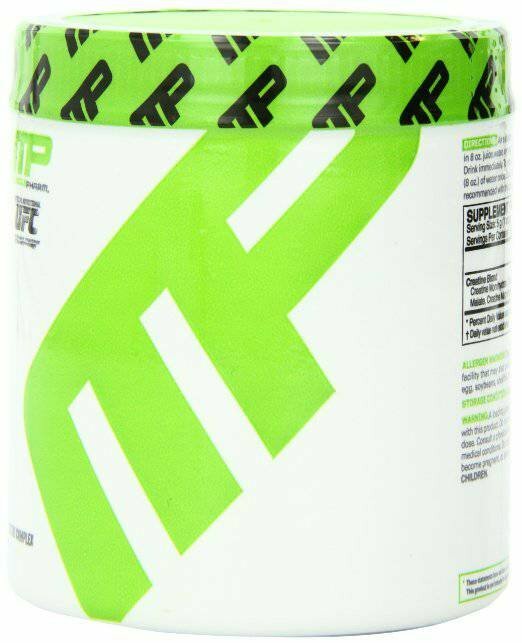 MusclePharm's Core Series Creatine is the ultimate blend of five different types of creatine. Our goal was to give your body the range of benefits from one of the world's most effective supplements.With Creapure, Creatine AAB (Creatine Alpha-Amino-N-Butyrate), Dicreatine Malate, Creatine MagnaPowerÂ® (Creatine-Magnesium Chelate) and Con-Cret Creatine HCL (100% Concentrated Creatine), MusclePharm has taken the concept of creatine to the next level. This proprietary blend of completely soluble creatines is what athletes have been missing, it promotes more energy and power in the weight room and ultimately, muscle gain. Our formula's clinically-suggested Cinnulin PF is added for better creatine absorption. It assists in transporting five diverse creatine blends into your muscles. The Cinnulin PF launches the creatine at the muscle's cellular level, making the product even more effective.The diverse creatine complexes deliver different benefits. These complexes varying speeds of absorption help your muscles immediately benefit from their effects, and this continues for a length of time. This helps the body to grow and recover. With increased absorption comes a rapid increase in the intracellular pool of phosphocreatine in skeletal muscle. Through this process, your body rapidly regenerates ATP, a cell's energy source.